Request 1 or more ring size(s) here. 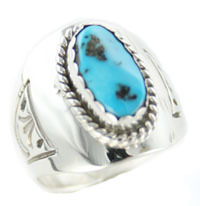 Sterling silver hand made ring with one free from sleeping beauty turquoise stone. There is twist wire and scalloped bezel around the stone. The shank is stamped with assorted stampings. Top measures about 1" in length. Navajo made. Size and shape of stone may vary.